Some things we just know for sure, and one thing I know for sure – I was a hot Italian mama in another life – straight up. No if, ands or buts about it! 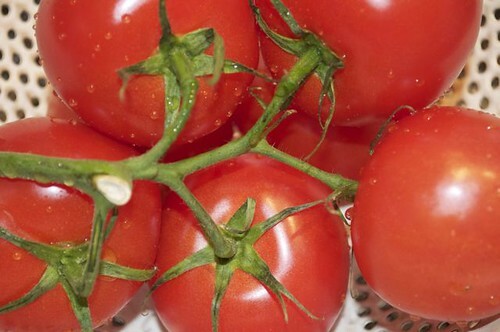 I eat, breathe, sleep, dream, walk & talk all things Italian – and whenever I start messing with tomatoes and heat I feel like Lucy Ricardo in that vat of grapes, or should I say I feel like the babe that’s in there with her – the feet do to the grapes what the heat does to the tomatoes – brings the extra to the ordinary. 1. 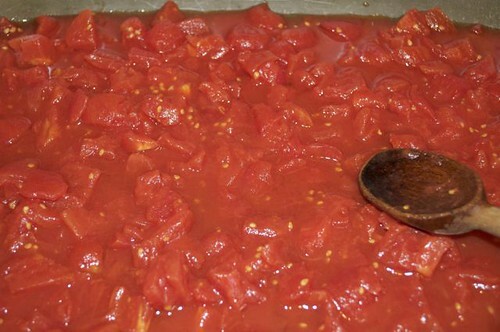 This is where it all starts – a mound of tomatoes. 2. 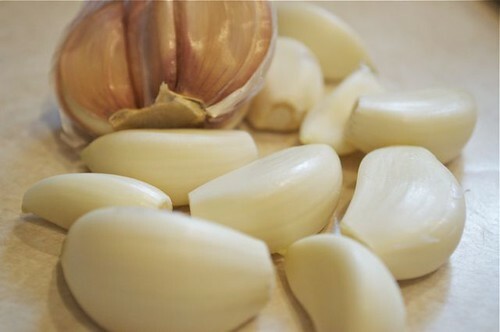 And always have a few garlic cloves ready to go. 3. 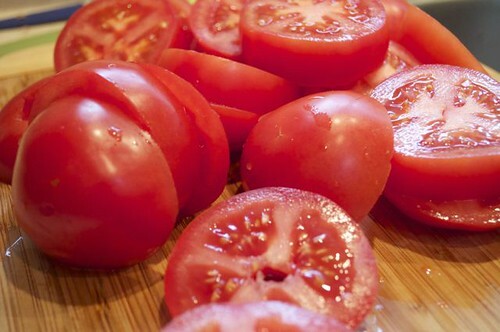 Cut them into thick slices. 4. 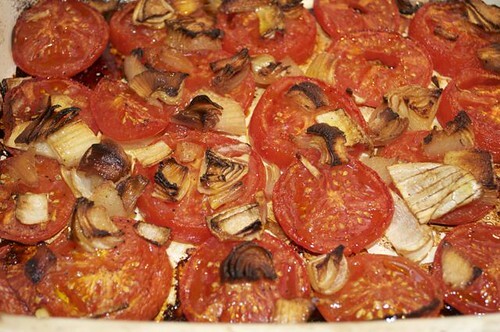 Nestle them into a baking pan – it’s the roasting that turns any tomato into a summer one. 5. 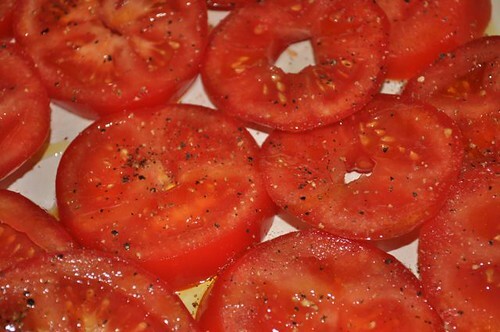 Sprinkle with salt & pepper and a drizzle of olive oil. 6. 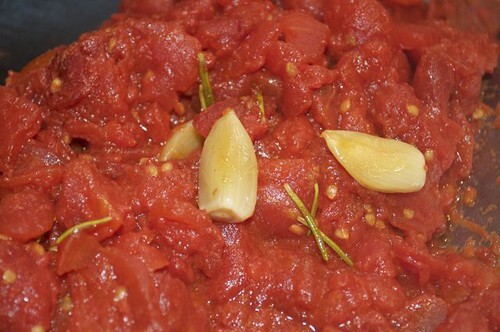 For added flavour – invite chopped onions and garlic to the party. 7. 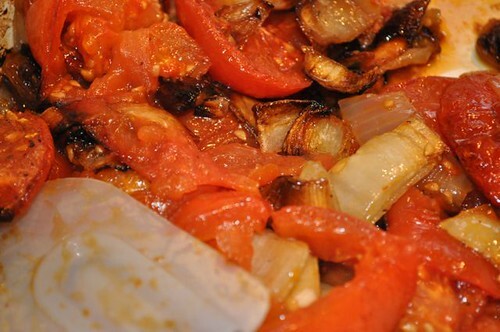 And just so you know you can – if you don’t have fresh, crack a couple of cans of diced tomatoes and they can be roasted just like fresh! 8. 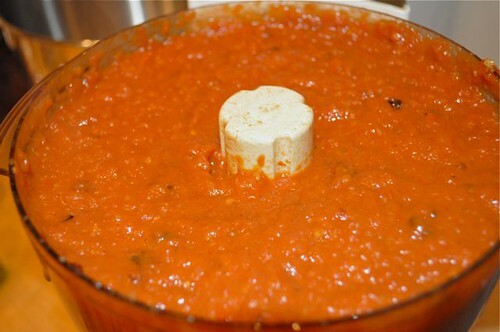 Spread in an even layer in a baking pan so it is no more than a 1/2″ thick. 9. 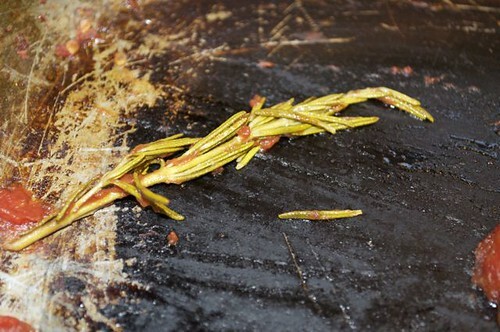 Tuck in a few garlic cloves and a sprig of something – I have rosemary. 10. 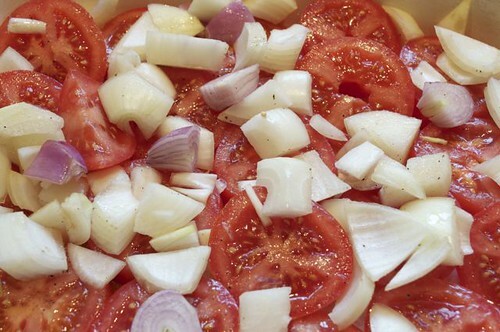 Mix it all around and put it in the oven for an hour or 2. 11. And then it will look like this. 12. 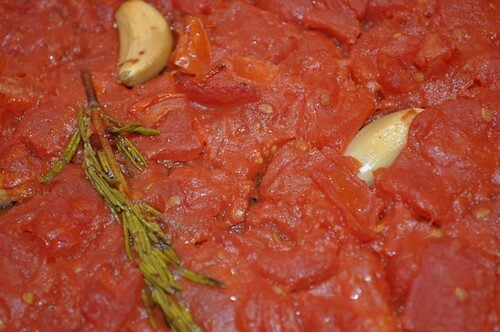 Here’s a closer look – no more liquid, soft creamy cloves of garlic and a rosemary sprig that’s put it in a full days work. 13. Remove any and all sprigs. If a few leaves remain, that’s a good thing. 14. See? It’s a good thing and as you can also see, the mixture can hold its own. 15. 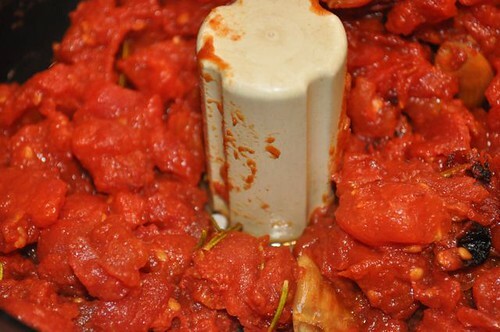 Put it all in the food processor. 16. And don’t you dare waste the tidbits in the pan – add a little water and scrape up all that flavour – imagine washing all that down the drain! I know, sinful! 17. 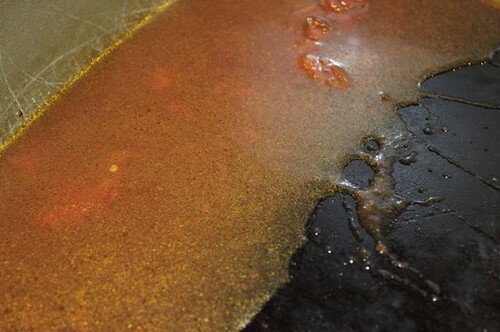 Remove the other pan from the oven and it will look like this. 18. And some of it will look like this. 19. Give it a stir. 20. 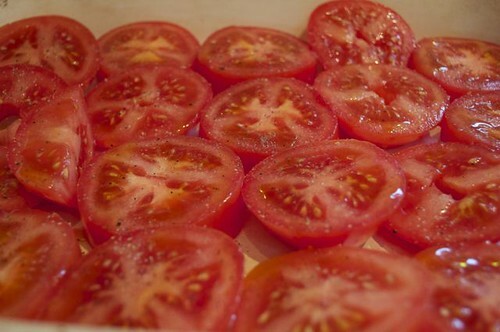 And pile that in the food processor with the rest of the tomatoes. 21. 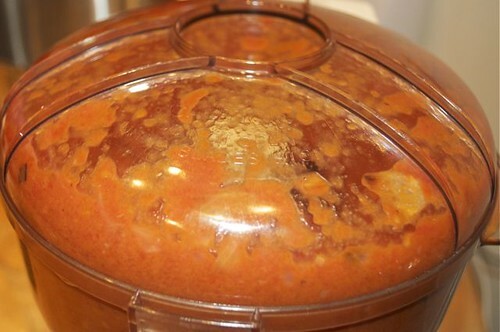 Put on the lid and start whizzing. 22. 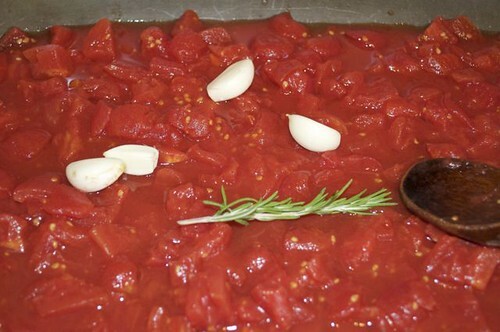 And now, meet your roasted tomato soup – the Italian inspiration is coming. 23. 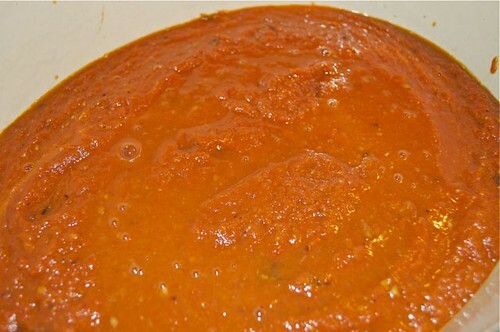 Pour it in a pot. 24. 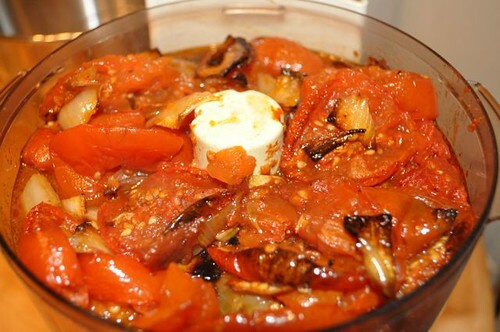 Add a little water, stock or red wine (yum!) 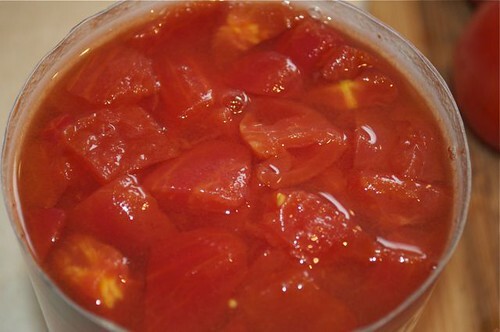 until desired soupyness is reached. 25. 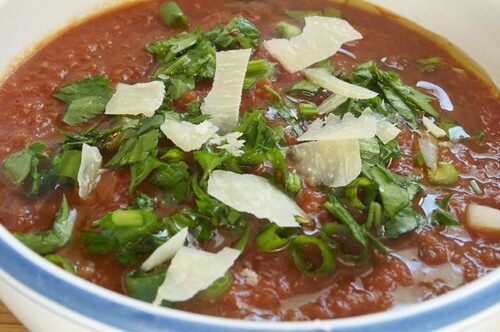 Gather a little Italian inspiration. 26. 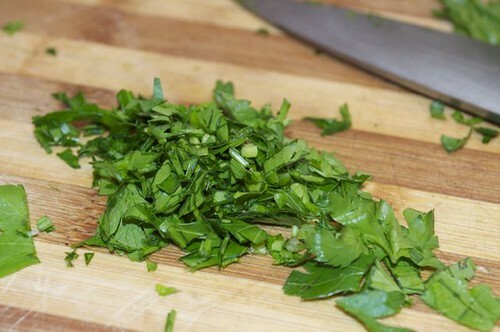 Chop a little flat-leaf parsley. 27. 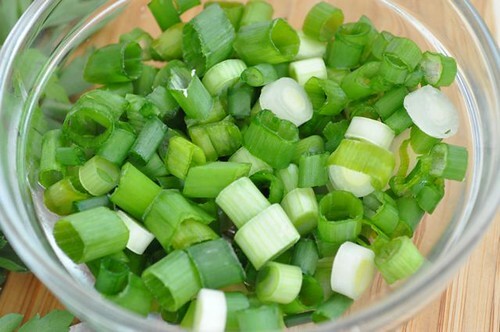 Slice a few scallions. 28. 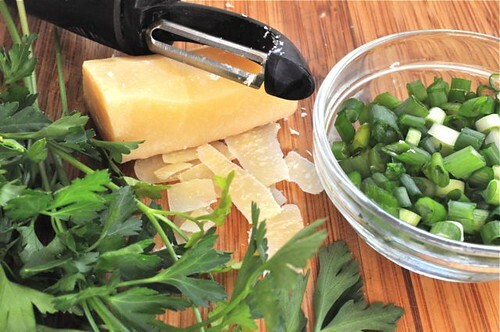 Shave a little parmesan – and yes, a vegetable peeler works magnificently! 29. 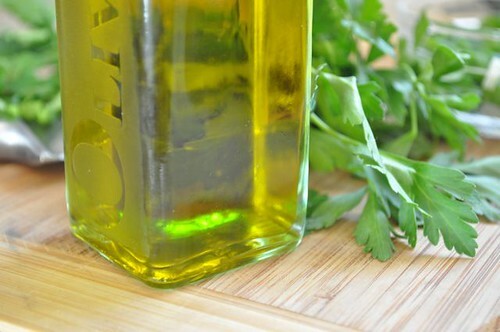 Have a little olive oil ready on standby. 30. 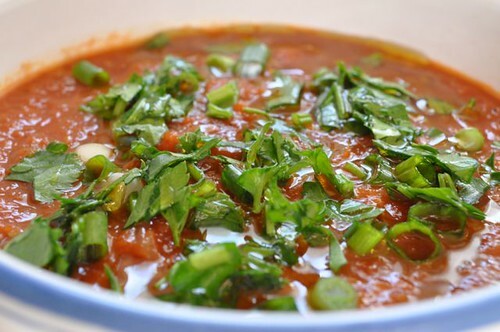 Ladle the hot soup in a bowl and start sprinkling – parsley and scallions. 31. 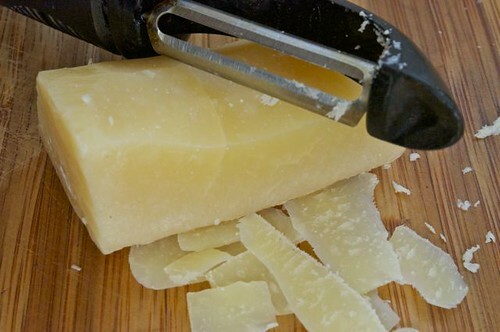 And finish with the shaved parmesan and a drizzle of olive oil – you won’t believe your tastebuds. 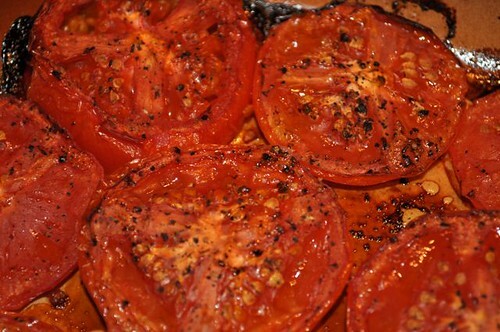 Roast until most of the moisture has evaporated – maybe an hour or 2. The higher the heat, the faster the roast. 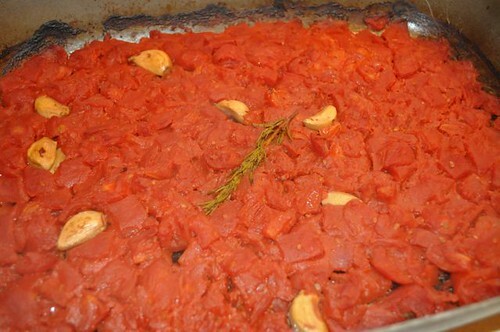 You’ll know they’re done when caramelization is evident and most of the water has evaporated. Remove any twigs and sprigs and purée using the method of your choice – hand held blender, food processor or stand alone blender. 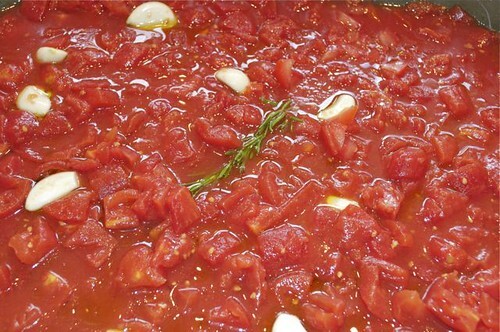 Once puréed return the tomatoes to the pot and start adding a little water, stock or red wine until desired consistency is reached – probably a cup or 2. 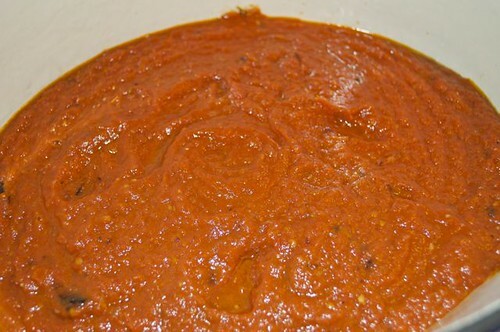 And if you don’t add any liquid, it’s pasta sauce.